This cult-favorite, multi-purpose lip balm soothes dry lips, calms and heals irritation, and soothes the sting of minor burns. Try dabbing on dry elbows or knees to condition, and relieve dryness. Also an excellent remedy for the treatment of diaper rash. Love the Sweet Taste and Smell, Hate the Greasiness. works well, but be careful! 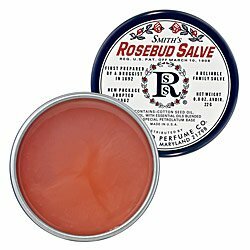 i purchased a tin of rosebud salve and had it in my pocketbook on a hot day, went to reach into my purse to get it and it had melted, the top had somehow come off and was all over my purse. be warned - it comes in a metal tin. I don't want to be mean, but I don't like this salve. It's greasy and I don't like the smell or taste at all. I also think it gave me some weird reactions -- caused an outbreak of some sort of lip eczema, yeah, doesn't sound very good does it. Getting the lid open took quite a while because the lid was too tight and there was nothing to grip the oily cover with. Time to redesign the container! The salve itself was like Vaseline but smelled better and was not as thick. Like Vaseline, it is effective for dry skin. I've used the original Rosebud Salve consistantly over the past 5 years. I saw it advertised in a Shopping magazine and saw that it got nice reviews. Obviously it snagged me from the get go. I buy 2 now everytime I replenish my stock. Aside from my wallet and keys, this is the only other mainstay in my purse. I confess that I first tried this product because I wanted to see what all the hype was about surrounding this "cult favorite". Well, I tried and I did see just what's so wonderful about this multitasking salve. First of all, the smell is quite nice, rose-y and baby powder-y. The tin is very cute too and I give it extra points since, unlike other tins, it's always easy to open. Be sure to keep it away from heat as it does tend to soften and could potentially cause a mess. It does its job very well as a lip balm since it's light and not sticky. It's a good moisturizer too, though I like it more in small areas like your elbows or parts of your hands. And I have to say it's really proved priceless as a cuticle and around-the-nail moisturizer (put some on, leave it for a little while, then massage in). Some other reviewers have recommended trying it on dry feet, I may try that some time. I guess the sky's the limit!